I understand that you have something that you'd like to say? 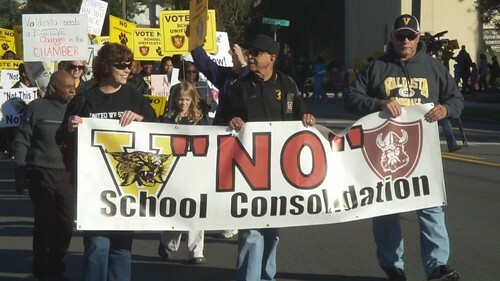 That's Sam Allen, president of FVCS holding the front Vote No sign; Vote No for the Children is holding another one. 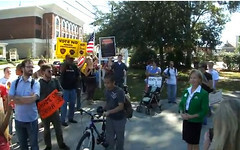 Greg Gullberg of WCTV is standing in front of Myrna Ballard, Jade Bulecza of WALB has a camera in the lower right, David Rodock of the VDT is standing behind Myrna Ballard in the video, Desiree Thompson of the VSU Spectator was there, Valdosta Today was there, George Boston Rhynes of K.V.C.I. and bostongbr on YouTube was there, and LAKE was there. Absolutely amazing! The grass roots effort, outspent by a 10 to 1 margin, defeat the CUEE effort by 4 to 1! That's what it's all about! This is what democracy looks like! Thanks to all the put in the time and effort and showed up at the polls. 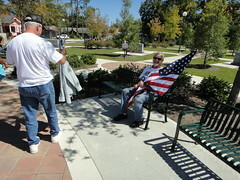 Now I hope we can have a serious discussion about the education of our children in Valdosta. Y'all in the county can, too. It turns out tracking students can help all students if done properly. CUEE's invited speaker Terry Jenkins co-authored a paper back in 1997 about Detracking Troup County: Providing an Exemplary Curriculum for All Students. He appeared to be saying de-tracking was an advantge of school consolidation. Back then tracking was apparently considered a bad thing. 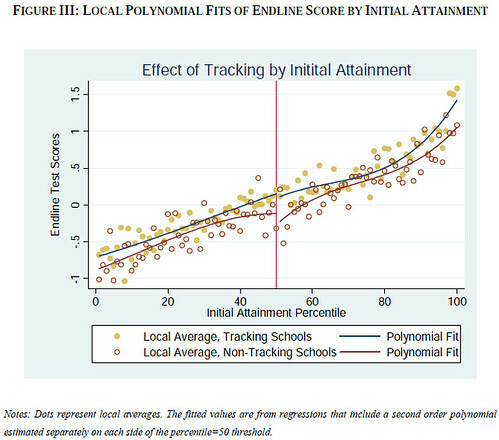 Recent research shows that actually tracking students can help all levels of students. So yet another supposed reason or benefit of consolidation turns out not to be true. The first sentence is the standard "diversity" argument that CUEE keeps making. The authors state it so as to poing out that their study finds that it's far from the whole story. The "unification" attack on the public schools in Valdosta and Lowndes County, Georgia is part of a nationwide assault on public schools, which has nothing to do with improving public education, and everything to do with private profit and private schools: disaster capitalism right here at home. And it's not government causing our local disaster: it's local business interests. What should we do about that? Critics of America’s public schools always seem to start from the premise that the pre-kindergarten-through-12th-grade public education system in this country is failing or in crisis. This crisis mentality is in stark contrast to years of survey research showing that Americans generally give high marks to their local schools. Phi Delta Kappa International and Gallup surveys have found that the populace holds their neighborhood schools in high regard; in fact, this year’s survey found that “Americans, and parents in particular, evaluate their community schools more positively than in any year since” the survey started. The first factor: New austerity budgets passed by state legislatures are starting to have a huge influence on direct services to children, youth, and families. Well, we don't have that problem in Valdosta City and Lowndes Schools. For example, graduation rates in Valdosta schools have been improving year over year, and both school systems are solvent. So what happened instead? Why, they made up a crisis instead! Here is the entire march southbound crossing the tracks. which we cited back in August. It now gets 404 "No Such URL at This Domain". 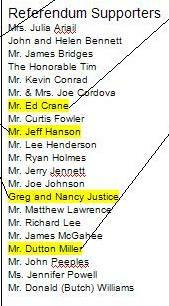 However, we know who they used to be, because that list got copied by Vote No for the Children to the two very interesting charts below, which show real estate and Valwood connections with CUEE.